1 Sit upright and well back in the seat. 2 Adjust the position of the seat forward or backward to ensure the pedals can be reached and easily depressed to the extent required. 3 Adjust the seatback so that the controls are easily operable. 4 Adjust the tilt and telescopic positions of the steering wheel downward so the airbag is facing your chest. 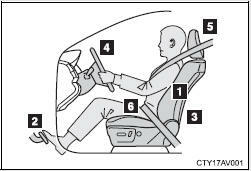 5 Lock the head restraint in place with the center of the head restraint closest to the top of your ears. 6 Wear the seat belt correctly. ■Adjusting the seat position ●Take care when adjusting the seat position to ensure that other passengers are not injured by the moving seat.